This year, we came across many cases of harassment and murders of transgenders in Pakistan; especially of the two cases from Peshawar and Sahiwal, where a transgender body was brutally hacked and on the other hand, in Sahiwal, a transgender was burned in the middle of the street and died while it was to the hospital. Although earlier this year, NA passed the transgender protection bill 2018 (protection, relief, and rehabilitation of rights of the transgender persons) which obviously needs time for execution. So, when I was asked to pick up an issue of our country which bothers me, I chose ‘transgenders’. The moment I got this project, I started thinking over it. The other day, I was just walking when I saw some trans women outside a mall getting verbally abused. That was the moment I realized that how even educated people don’t consider transgenders as individuals and how miserably they mistreat them. That is when I decided to opt for the issues of the transgender community for my project. Fortunately, I got in touch with Aradhiya Khan, who’s a social activist for transgender rights and is doing a lot more for the same. I am thankful to Aradhiya for being an amazing model and her utmost cooperation – I wish more power to her! Every day while going to the office or coming back from universities, we get to see transgenders on the street begging for money in their very own accent. The sad part is how extremely they’re being accused of putting on fake identities and begging. No wonder we, our own selves, are the ones who do that every other day. The picture says it all, how transgenders are verbally abused and are called shameful phrases when they beg on the streets. Undoubtedly, humans have evolved into merciless animals over time! This causes a bunch of people harassing all those they consider lower than them every day. One of the major issues is that people from the trans community often get harassed or bullied which leads to immense consequences. Verbal abuse, bullying, and harassment whereby making transgenders embarrassed over their identities bring in depression. This, in turn, has surged up the rates of suicidal ideation and the cases of self-harm. The foremost thing deserved by all human beings is equality. 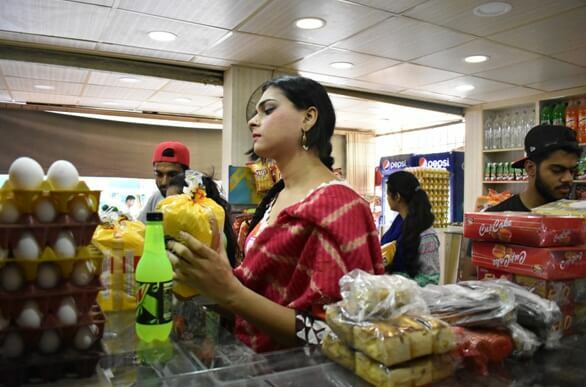 In this picture, a trans woman purchases stuff from a shop where no one makes a scene out of it and acts normal. No shame associated with them, no harassment, and no bullying! Things must go like this only. Things must be equal for each and every human out there. Trans people are ordinary people like us and so they should be socially accepted. They should be allowed to have a normal living and to be friends with everyone. We must work here and bring acceptance and consideration towards their identity.